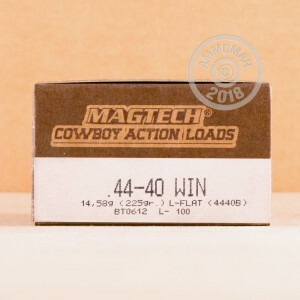 This 44-40 ammunition is a great target or cowboy action shooting load for your revolver or long gun. 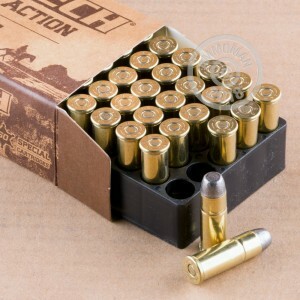 Manufactured by CBC of Brazil, these cartridges fire a heavy 225 grain lead flat nose bullet at about 725 feet per second, delivering good accuracy at a reasonable price. Each box contains 50 rounds. Like other Magtech products, this ammo is manufactured in Riberao Pires, Brazil and uses non-corrosive Boxer primers and brass cases. Not all ranges allow lead nose ammo, so make sure you can use this ammo at your venue of choice before ordering. Grab over $99 worth of products from AmmoMan.com in a single order to qualify for free shipping!